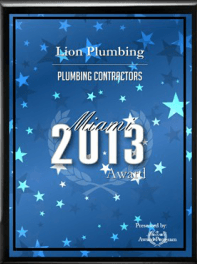 Sanitary Video Camera Inspections in Miami-Dade, Broward and Palm Beach | Lion Plumbing, Inc. If you are experiencing drainage issues in your home, it may be a sign	that there is some type of blockage in your sewer system. This can be	very difficult to diagnose without a thorough inspection, even if you	have a suspicion of where the problem lies. You should trust this service	to an experienced plumber from Lion Plumbing, Inc. We can offer you a	sanitary video inspection to establish the source of the blockage. This	inspection is completed by using a video camera which is snaked through	the sewer line. Once we have determined where the problem is, we can offer our services	to repair it. Call our team today for an inspection (305) 597-4555.